Mercedes-AMG is rising to the challenges of the automotive future: the SLS AMG E-CELL showcases state-of-the-art development of an exciting super sports car with a zero-emission high-tech drivetrain. Boasting a power output of 526 hp and 649 lb-ft of torque, this prototype vehicle from AMG offers exceptional performance. The gullwing with electric drive is part of the company strategy entitled "AMG Performance 2015" which aims to continually reduce fuel consumption and emissions. With the SLS AMG E-CELL, Mercedes-AMG is providing a glimpse of its latest development project - a powerful and locally emission-free super sports car. Finished in fluorescent "AMG lumilectric magno" paint, the gullwing offers a glimpse at a possiblesmall series production vehicle and at the same time reflects the innovative strength and development expertise of the AMG performance brand. "We take social responsibility very seriously and with the SLS AMG E-CELL we are demonstrating a further milestone in our "AMG Performance 2015" strategy. It is our goal to continually reduce the fuel consumption and emissions of new models in the coming years, while at the same time enhancing the core brand value of performance", explains Ola Källenius, chairman of the board (from 1 July 2010) of Mercedes-AMG GmbH. 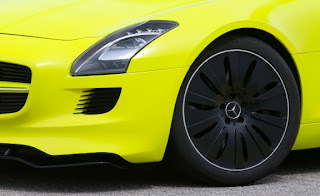 With the SLS AMG E-CELL, the performance brand of Mercedes-Benz is launching a totally innovative drivetrain for super sports cars, reaching new territory in this market segment. This very special gullwing is therefore able to "electrify" the driver with a completely unique, effortlessly superior and emotional super sports car driving experience, even at this early, prototype stage of development. In brief: the SLS AMG E-CELL is true to the AMG brand. The prototype vehicle is slowed with the aid of AMG ceramic composite brakes, available as an optional extra for the series production model, which boast extremely short stopping distances, a precise actuation point and outstanding fade resistance, even in extreme operating conditions. The over-sized discs - measuring 15.8 x 1.5 in. at the front and 14.2 x 1.3 in. at the rear - are made of carbon fiber-strengthened ceramic, feature an integral design all around and are connected to an aluminum bowl in a radically floating arrangement. The AMG Drive Unit, which is angled towards the driver, houses buttons for starting the motor, and the ESP® functions, the AMG memory function and the extendable front splitter and rear spoiler. Using three new buttons, the driver can switch simply between P, R and D. The park setting is also enabled automatically by switching the electric motors off.